Mondays are a great day during summer! Why? We get to link up with Tara for her Monday Made It! It forces me to get a few things accomplished each week! This week was a little tough to get my tasks done, just got back last night from New York! What a looooooong drive! Traffic and rainy weather didn't help! We got to visit many sites and dear friends, but it's nice to be home. My first made it are these adorable, personalized hand sanitizer bottles for my children's teachers. I saw them on Etsy a couple of weeks ago ranging in price from $5-12 PLUS shipping! I knew I could make these cute gifts for less! I also like to take care of the teachers on my team, so I made these binder clips for them. I found the clips at Dollar Tree and I used the 80 count labels. I also completed another product for my Teachers Pay Teachers Store...Multiplication Rings. I try to offer my students incentives and resources to help them master these facts because you know we don't have extra time to "practice and drill" these facts all day! I have a class set of these Crystal Light containers-I've been saving them all year to hold these rings. I decorated the taller container with scrapbook paper, the shorter one has been left clear. In the past, they've kept them in their pencil boxes. ***Want to win them? Pin this product and paste the URL in the comments section. (Make sure I have your email address if you're not a blogger, so I can email you this goodie!) Winners will be announced tomorrow! 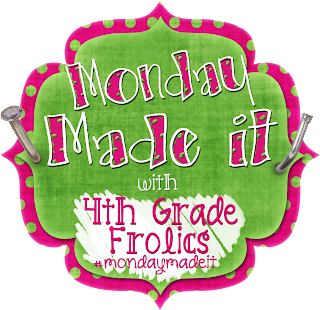 Go check out all the other great Monday Made Its! Now that I'll be teaching 3rd graders.. I'm all over it! I love your clips! I think I'll make a set for all the teachers in my department. So cute! I love your projects for MIM! I would love the multiplication facts! My kids always need a lot of practice! You've been busy! I think I'll make those clips - good to know they have them at the Dollar Store! I love that everyone has their own cute container for their math facts. Thank you for sharing. Those are fabulous, love the pringles can storage idea. This is such a great idea for each student to take ownership of practicing their facts!! Love, love!! Welcome home!!! Glad to hear you had a nice trip to NY, but it is always nice to be home, isn't it? Those bottles are adorable! You are so crafty!! The multiplication rings are adorable!! :O) You are so good!